Savannah is a southern city steeped in history. Real life is more fun than the stories. But oh how much more rich the southern storytelling when one wants to make the 1940s come alive for 21st Century visitors. Any day now we're hoping to spot the filming crews for the third World War II miniseries from Tom Hanks, Steven Spielberg and HBO. 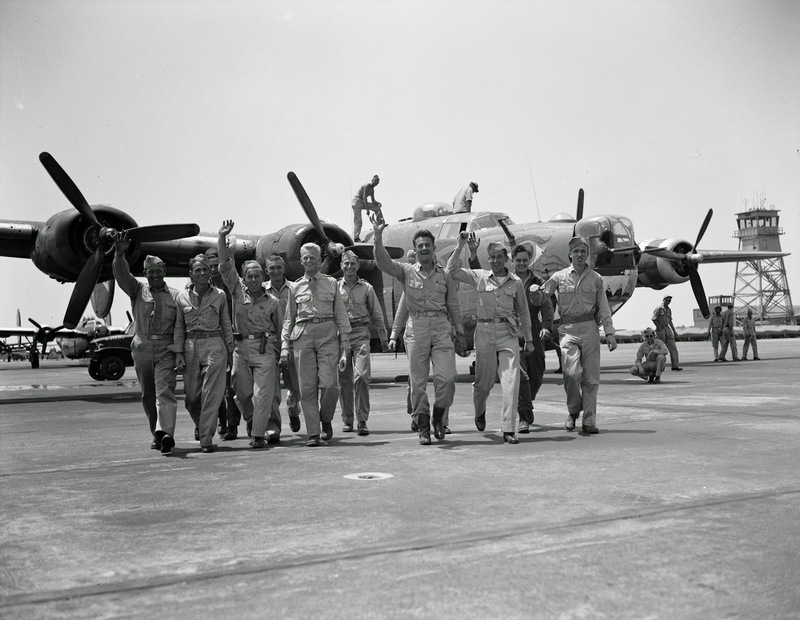 It's about the Eighth Air Force -- the men of the Mighty Eighth. Stop for a burger at Betty Bombers to click quickly into the vibe. B-24 airplane, in Savannah, Georgia. Atlanta History Center. Used under paid license. SAVANNAH Georgia (October 14, 2013) -- Yes, it's true. Laced within the chronology of Savannah's story and life in the 1940s are romantic stories -- love of family, love of country, love of our city. Those endure today, demonstrated as we daily and happily share our B&B inns' hospitality with thousands of the city's millions of international visitors each year. Not to be confused with stoic, our fun-loving Savannah has been called a "living museum" for good reason. History lives in everyday life here and in nearby places. We want to tempt your interest by hop-scotching through the 1940s. 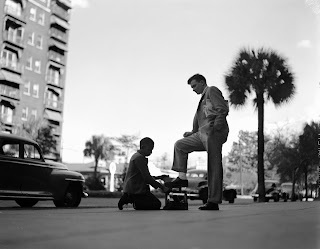 We think you'll come to see how we love to keep the best of the old, and dress it up with the new in Savannah. For some who visit Savannah it's love at first sight! Today we have speedy communications via the Internet and wireless phones. In the 1940s the new technology of the black and white television broadcast was very limited in the United States. Families listened to radio and sat together at the family table for meals. It's hard to imagine, but telegrams and land line telephones were the fashionable technologies. In 1946 the National Numbering Plan (area codes) was implemented, and the first commercial mobile phone call was made. what appears to be Drayton Street in Savannah, Georgia. May 17, 1947 | Kenneth Rogers, photographer. Copyright Kenan Research Center, Atlanta History Center. in Key West, Florida during World War II. From the day that the Japanese bombed Pearl Harbor in Hawaii (December 7, 1941) until V-J Day, the end of the fighting in World War II (August 14, 1945) Savannah and her citizens double-downed as an international port and military town in support of America at war, abroad. Over 50,000 citizens worked in the shipbuilding industry during those years. In August 2005, Savannah Morning News listed "60 Years, 60 Remembrances" -- the spots and names where citizens and city visitors could honor the "Greatest Generation". Savannah's own Johnny Mercer, already successful in the music industry as a co-founder in Capitol Records, wrote patriotic songs for movies and entertained U.S. troops on the West Coast. In 2009, a bronze statue was sculpted by Savannah artist Susie Chisholm to honor our famous son. The statue is located on the west side of Ellis Square. A good place to start for 2013 Savannah visitors is to see Jukebox Journey at the historic Savannah Theatre -- "Popular music and professional choreography from the 1940′s to the present are presented in a bright, colorful, and fast-moving production filled with lavish costumes and comedic skits." The Bleu Belle boutique is a hot spot for contemporary fashion in Savannah, carrying a line of clothing called “vintage belle” that is vintage pieces from the 1940s through the 80s. Like we do almost every day now, in Travel+Leisure Magazine's feature, "Seductive Savannah | T+L Golf", they recommend Mrs. Wilkes. "After the round [of golf], stop in for lunch at Mrs. Wilkes’ Dining Room on Jones Street, where since the 1940s patrons have gathered at communal tables to be served family-style portions of deliciously rendered Southern fare such as fried chicken and baked ham. Then, either on your own or with a guided group, explore the beloved historic district, which is home to many well-shaded public squares and magnificent porch-wrapped mansions." In 1943 Green-Meldrim House on Madison Square was sold to St. John's Episcopal Church. It had been the headquarters of General William Sherman during the American Civil War. It now serves as a parish house and is open to the public as a house museum. The "Waving Girl" Florence Margaret Martus (1868-1943) died in 1943. The fame that the Waving Girl brought to Savannah has been memorialized in a statue by Felix DeWeldon who was also the sculptor of the Iwo Jima Memorial in Arlington, Virginia. The statue is located on the east end of River Street, along the Savannah harbor. Swarms of sailboats took advantage of the Atlantic Ocean waters off the Georgia coast, especially Tybee Island. The waters of the Wassaw Sound near Tybee and Savannah hosted the 1996 Atlantic Olympic Yachting venue. The Olympic Torch Sculpture is on River Street to commemorate the event. Sailing and other water sports attract vacationers to the Savannah area year around now. In the 1930s and 1940s an art colony formed along Factor's Walk in the waterfront district. Chatham Field is now the Savannah/Hilton Head International Airport, a part of the City of Savannah acquisition in the 1940s. The initial 600 acre tract is in the vicinity of Cherokee Hill, one of the highest elevations in the county. Construction of a new airfield commenced under a Work Projects Administration (WPA) project. WPA was the largest and most ambitious New Deal agency, employing millions of unemployed people (mostly unskilled men) to carry out public works projects. Three runways were constructed running N-S, E-W, and NE-SW; each 3,600 feet long. Named "Chatham Field", the airport was an used as a bomber and crew training base for B-24's and other fighter aircraft until the end of World War II. The Eighth Bomber Command (Re-designated 8th AF in February 1944) was activated as part of the United States Army Air Forces January 28, 1942, at Hunter Field in Savannah, Georgia. An historical plaque is located in downtown Savannah at the corner of Park Avenue and Bull Street, marking the "Mighty Eighth" headquarters. Open seven days a week, the National Museum of the Mighty Eighth Air Force is located in Pooler, just off I-95, west of Savannah. Hunter Field is now Hunter Army Airfield. On 30 August 1940, the United States Army Air Corps received approval to build a base at Hunter Municipal Airifeld, the first airport for the City of Savannah. Official dedication of the airfield as Savannah Army Air Base took place 19 February 1941. At the end of the war, Savannah AAB was used as a Separation Center for the discharge and furlough of service members returning from Europe. In 2013, Hunter Army Airfield is home to units of the 3d Infantry Division, including the "Marne Division's" Aviation Brigade. Hunter's 11,375-foot-long runway supports the installation's rapid deployment needs as any aircraft, including the C-5 Galaxy, can land at Hunter. Hunter Army Airfield has a unique distinction as being identified as an alternate landing site for NASA's space shuttles. Since 1945, the Georgia Ports Authority has coordinated international trade investment, which enriches the state of Georgia's economy in Savannah and Brunswick. Along Savannah’s waterfront visitors can watch Savannah River traffic. Savannah tourists are often surprised at the size of ocean-going vessels that move up and down river, to and from the port guided by a local fleet of tugboats. Pleasure craft, including mid-sized cruise liners, often anchor at Rousakis Plaza. In 1945 the president of Savannah Gas, Hansell Hillyer, and his wife Mary, began restoration of buildings in the 10-acres complex of Trustees' Garden, owned by the gas company. Shocking the naysayers, Mrs. Hillyer successfully renovated old clapboard cabins into rental units. A fashionable neighborhood rose up. The project proved restoration could be profitable. Source: Savannah, a history of her people since 1733, Preston Russell, Barbara Hines. Today the Pirates House Restaurant and Charles H. Morris Center are located on the property. A new amphitheater is now in construction. Mrs. Marmaduke Floyd (Delores Boisfeuillet Floyd) restored The Pirates' House and adjoining Herb House. Fort Screven on the north end of Tybee Island remained an active U.S. military post until 1947. As a ranking lieutenant colonel at the time, the later famous World War II General George C. Marshall had been commander at Fort Screven during the 1930s. "In June 1947 Secretary of State George Marshall delivered carefully worded remarks committing the United States to consider a plan for reconstruction of Europe. The remarks became known as the Marshall Plan Speech which initiated the post-war plan known as The Marshall Plan." Source: MarshallFoundation.org The Tybee History Museum is open to visitors in a re-purposed, concrete artillery battery. George Marshall's #Tybee Island office and 'Officer's Row' home are private residents, still standing much as they appeared in the 1930s. The Georgian Tea Room in James Habersham's Pink House mansion (now The Olde Pink House, a fine dining restaurant) on Reynolds Square was rescued by Alida Harper Fowlkes. The affluent Mrs. Fowlkes and her friends served as waitresses. "Born in Savannah on September 16, 1943, before integration, James Alan McPherson recollects playing hooky from school in order to read in the "colored branch" of the local Carnegie Library [on Henry Street]." Source: New Georgia Encyclopedia. McPherson's early short story "Gold Coast" won the 1965 Atlantic Monthly Firsts award. In 1978 he was the first African American recipient of the Pulitzer Prize in fiction for his 1977 story collection, Elbow Room. 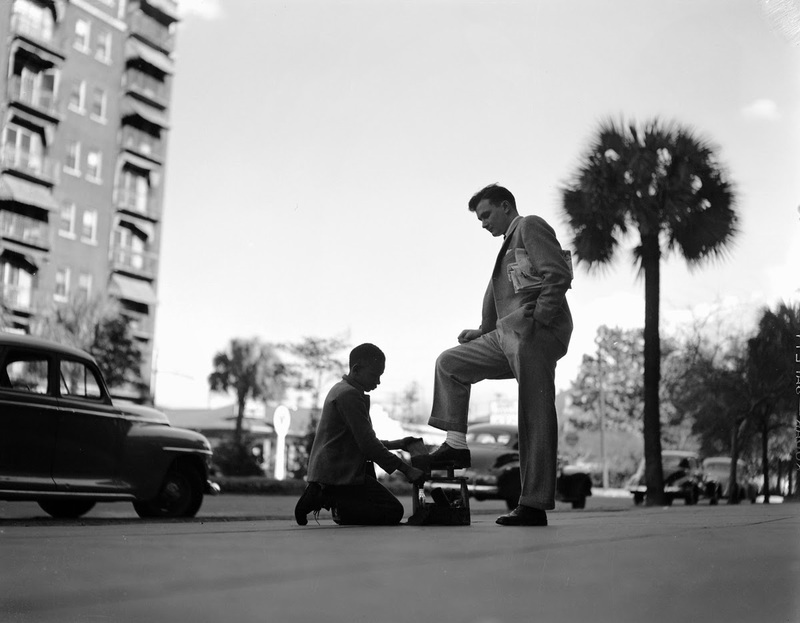 The post World War II period was an important era in the lives of Savannah’s African-American population. In 1947, long before the turbulent 1960s, nine black police officers were appointed to the Savannah Police Department. This was largely attributed to a voter registration drive launched by the Reverend Ralph mark Gilbert, who served as pastor of the First African Baptist Church located on Franklin Square. Visitors are welcome to tour the church on Franklin Square and the Ralph Mark Gilbert Civil Rights Museum located on Martin Luther King, Jr. Boulevard. On the northeast corner of Drayton and Liberty streets stands Drayton Towers which is the only example of the International Style architecture in Savannah. In 1949, Billy Bergen son of Savannah architect Cletus Bergen (for whom the Savannah College of Art and Design’s Bergen Hall for the photography program is named; 101 Martin Luther King Jr. Blvd.) submitted the design. In 1951 the building was completed as designed. In 2013, the property is under renovation for luxury condomeniums. On the lower level are chic new spots that include BT Byrd's @ Drayton Tower (a chic cafe, open 7 days a week, 9am-9pm), The Beer Growler (45 taps for the beer-jug-to-go market), and Rob's Salon (voted Best Savannah Salon 2012 by Savannah Magazine readers). 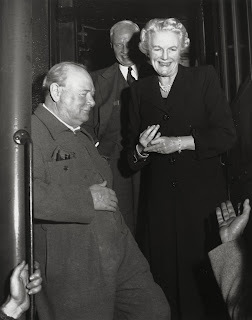 A month before the International Monetary Conference (IMF; March 1-18, 1946) was held at the Oglethorpe Hotel, visitor Lady Astor delivered her backhanded compliment: "Savannah is a beautiful lady with a dirty face." -- the now-infamous line shamed Savannah. A month later, Lady Astor struck again: "Even if the International Monetary Fund Conference has not put Savannah on the map, at least I have." Source: Savannah: A History of Her People Since 1733 by Preston Russell, Barbara Hines. By the 1960s seven women headed throngs of citizens to form the Historic Savannah Foundation, leading to the city's now-famous pace-setting preservation in the National Landmark Historic District. Our heralded historic Savannah inns are among the proud old homes restored. Our bed and breakfast renovators love to help keep Savannah beautiful! Our Romantic Inns of Savannah invite you to "Come for a visit!" You'll love Savannah, so often proclaimed as one of the most beautiful in America. You may even decide to call her 'home'. Copyright © 2013 Romantic Inns of Savannah / Sandy Traub. - National Museum of the Mighty Eighth Air Force Welcomes 100th Bomb Group and HBO, Savannah Daily News, October 16, 2013 – "The National Museum of the Mighty Eighth Air Force this week will be welcoming the 100th Bomb Group of the Eighth Air Force for its reunion. 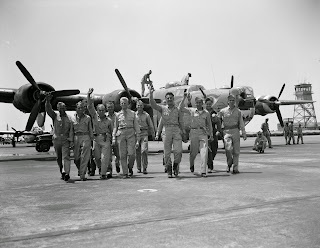 Film crews will be visiting at the same time to begin work on the upcoming HBO miniseries on the Eighth Air Force, entitled Masters of the Air...."